While his tragic death occurred almost one hundred years ago, Hobey Baker's legacy continues to this day, and he is regarded as the first American-born hockey star. 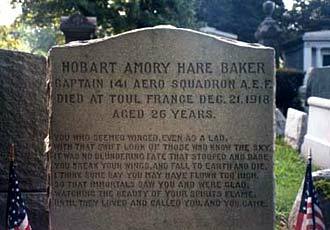 Hobart Amory Hare 'Hobey' Baker was born on January 15, 1892 in Bala Cynwyd, Pennsylvania, a community in the southeastern part of the state bordering on the western edge of Philadelphia. The area was originally settled in the 1680's by Welsh Quakers and was named after the town of Wales and the village of Cynwyd in Wales. Hobey was the second son of Alfred Thornton Baker, a successful upholsterer, and Mary Augusta Pemberton, a socialite. Alfred, who was called 'Bobby' by his friends, was a very good athlete, and while attending Princeton University in the 1880's, played football. Baker was named after his uncle, Dr. Hobart Amory Hare, who was president of the Jefferson Medical Hospital in Philadelphia and was the obstetrician at the baby's birth. 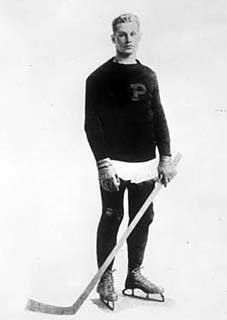 Hobey Baker entered Princeton University in 1910 and led his team to an undefeated season in 1911-12 that culminated in an intercollegiate championship. Alfred and Mary faced marriage problems and at the age of 11, Hobey and his brother Thornton (a year older) were sent to Concord, New Hampshire to board and study at St. Paul's School. The boys' parents divorced a few years later, an unusual occurrence at the time. While attending St. Paul's, Hobey was introduced to a fledgling game called hockey. He was an exceptionally fast skater and worked diligently on his puckhandling by skating on the frozen ponds nearby after school, working on skating with the puck on his stick and not looking down at either his feet or the puck. By the time he was fourteen, Baker had been named to the school's varsity team, and he helped St. Paul's defeat some of the best prep schools and universities in the United States. Hockey was not the only game at which Hobey excelled. In his first attempt at golf, he managed a score in the low 40's on the St. Paul's nine-hole course. For fun, he once entered St. Paul's annual cross-country race and won, beating several of the school's better runners. While swimming, Hobey was described as performing "like some sort of engine." At the age of fifteen, Baker was selected as the school's best athlete for his accomplishments in hockey, baseball, football, tennis, swimming and track. 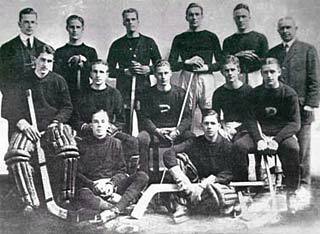 (Pictured Second Row Middle): Hobey Baker captained the Princeton Tigers to the 1913-14 collegiate title. In 1907, Baker's father lost much of his wealth during a recession, and the decision was made to send but one of his boys to university. Acknowledging his brother's athletic prowess, Thornton agreed to let Hobey continue, a selfless decision that Hobey never forgot. Although he was an above-average student, Baker stayed at St. Paul's for an extra year in 1909 in order to allow his father another year to save money. 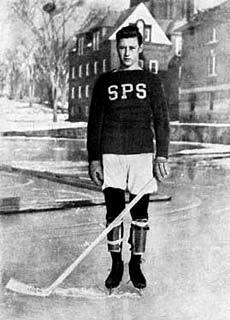 By the time he left St. Paul's, Hobey's sporting achievements had made him one of the school's most popular students. In 1910, Baker enrolled at Princeton University where he joined the school's hockey, football and baseball teams during his freshman year. The university's rules stated that students could play but two varsity sports, so Hobey focused on hockey and football, surrendering his outfield position on the freshman baseball team. Baker was readily recognizable on the football field as he was one of the few players to not wear a helmet. Local sportswriters tagged him "the blond Adonis of the gridiron." Princeton won the national championship that year with Baker scoring 92 points, a school record that stood until 1974. After graduating from Princeton, Hobey Baker suited up for the St. Nicholas amateur team in New York City. That same fall, Baker joined the school's hockey team. Princeton finished the 1911-12 season with a record of eight wins and two losses in ten games. Princeton played most of its home games at the St. Nicholas Rink in New York City, one of the few arenas anywhere in the world with artificial ice at that time. Hobey was named captain of the football team in 1913, his senior year. Through his three-year football career with the Princeton Tigers, Hobey recorded 180 points, a school record that lasted until 1964. He was awarded a varsity letter in football five times. Combined with the three letters he earned in hockey, his eight letters were the most that could be earned at Princeton at the time. Princeton won the 1914 national championship with a record of ten wins and three losses. Although statistics were not kept of his time at Princeton, Hobey is estimated to have collected more than 120 goals and 100 assists during his three-season career. Besides his obvious skill, Baker was regarded for his sportsmanship. After every game, he visited the dressing rooms of his opponents and shook hands with every player. The final hockey game of Baker's career at Princeton was held in Ottawa at Dey's Arena, played against the University of Ottawa for the Intercollegiate Hockey Championship of America on February 28, 1914. Ottawa defeated Princeton 3-2 score. In the spring of 1914, Hobey Baker graduated from Princeton with a degree in history, politics and economics. He was also named the school's best football player, best hockey player and best all-round athlete. After graduating, Baker toured Europe as a celebrity correspondent for the New York Times. When he returned home, Hobey secured a position with Johnson and Higgins, a major Wall Street insurance firm, but when soon after he was offered a job at J.P. Morgan Bank, he accepted. Quickly tiring of his office job, Baker continued finding excitement through sports. 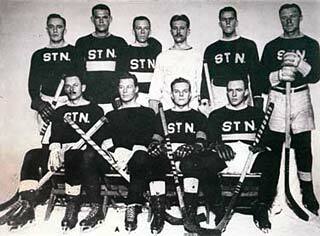 He joined the St. Nicholas Club, an amateur hockey club based in New York. Well known from his hockey exploits at Princeton, the marquee at the St. Nicholas Rink often read: 'Hobey Baker Plays Tonight.' Uncomfortable with the attention, Baker eventually asked the building manager to take down the sign. While playing with the St. Nicholas Club, he was offered a contract of $20,000 to play three seasons with the Montreal Canadiens of the National Hockey Association. He declined, preferring to remain amateur. On March 24, 1917, Baker played his final hockey game at the Winter Garden at Exposition Hall in Pittsburgh. The game featured an amateur all-star team from Philadelphia, led by Baker, pitted against an all-star team from Pittsburgh's amateur leagues. The Philadelphia team defeated Pittsburgh in overtime by a score of 3-2, with Baker scoring all three Philadelphia goals. Hockey's physical toll brought to a conclusion Baker's hockey career in 1915. In addition, the growing professionalism went against his belief that sports should simply be played for the love of the game. In 1916, Baker joined the civilian aviation corps. The United States' entry into World War I allowed Hobey to make good use of his pilot training. He was one of the first Americans to sail for Europe when they left the U.S. on August 23, 1917. He was promoted to lieutenant in March 1918, assigned to the 103rd Aero Squadron and sent to the front a month later. On May 21, 1918, he shot down his first enemy plane, although a complicated system of confirming kills meant he was not given credit for it. In a letter home describing the battle, he said it was the "biggest thrill (he) ever had in (his) life" and compared the feeling to the exhilaration of a major sporting game. 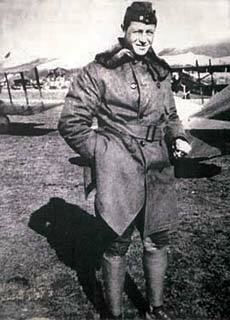 Throughout the spring of 1918, Baker continued to lead planes over the front. The French government awarded Baker its Croix de Guerre after his first confirmed kill in May 1918. During that summer, Hobey was transferred to the 13th Bomb Squadron. In July, he and two other pilots shot down a German plane. By August, he was again promoted and given command of his own squadron  the 141st Squadron, comprised of 26 pilots and 180 enlisted men stationed behind the front line where they waited for equipment to arrive before leaving for the front. In early October, Baker was promoted again and given the rank of captain. In honour of his alma mater (Princeton), he had the planes painted black and orange, the school's colours, and had a tiger for the insignia to honour the name of his hockey team. Baker recorded two more kills in early November, the final kills of his career, and shortly thereafter, the Armistice brought World War I to a conclusion. On December 21, 1918, Hobey Baker received his orders to return to the United States. Reluctant to leave France and return to life in America, he decided to take one final flight at his squadron's airfield in Toul. In heavy rain and pushing aside protests from his squadron, Baker took off, but a quarter-mile into the flight, the engine failed. He decided to attempt to land the plane at the airbase, but a few hundred yards from the airfield, his plane crashed nose first into the ground. Baker was freed from the plane but died in an ambulance minutes later. After he died, his orders to return home were found in his jacket pocket. Many still speculate that Baker, dreading the monotony of a life in business, may have taken his own life. Not long before the crash, Baker told a fellow Princeton alumnus that returning to a life in business meant that his life was over and he would never again experience the thrills of football or hockey. With that swift look of those who know the sky. You break your wings, and fall to earth and die. Until they loved and called you, and you came."